A 64-year-old man was referred to our hospital for workup of a pancreatic mass. 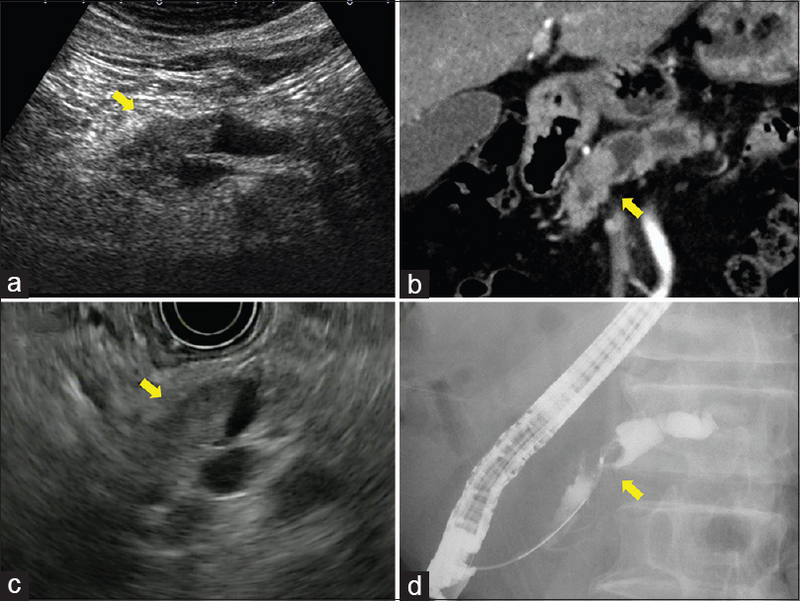 Ultrasonography revealed dilatation of the main pancreatic duct (MPD) in the body and tail of the pancreas [Figure 1]a. Abdominal computed tomography demonstrated a mass in the head of the pancreas with gradual enhancement [Figure 1]b. EUS showed a hypoechoic mass in MPD, measuring about 16 mm × 14 mm, with dilatation of MPD in the pancreatic body and tail [Figure 1]c. Endoscopic retrograde pancreatography showed obstruction of MPD in the head of the pancreas [Figure 1]d, and we performed biopsy of the lesion. Histological examination of the biopsy specimen suggested combined carcinoma with both ductal and neuroendocrine features. Subtotal stomach-preserving pancreatoduodenectomy was performed. Macroscopically, MPD was occluded by a solid tumor, which measured 16 mm × 8 mm in size and extended 33 mm in length, while we could not find a macroscopic solid lesion in the parenchyma. Microscopically, the tumor consisted of two components: one was a ductal component of cells with irregularly shaped nuclei and conspicuous nucleoli [Figure 2]a and [Figure 2]b and the other was a neuroendocrine component of cells with round nuclei, “salt-and-pepper” chromatin, and eosinophilic cytoplasm [Figure 2]c. The transitional zone with minimal invasion into the pancreatic parenchyma was observed in the branch duct adjacent to MPD [Figure 2]d. Immunohistochemically, the former component was positive for cytokeratin-19, CA19-9, and carcinoembryonic antigen (CEA) [Figure 2]e, but not for endocrine markers [Figure 2]f, while the latter was positive for chromogranin A and synaptophysin [Figure 2]g, not for CEA [Figure 2]h. Ki-67 labeling index was over 20% in an endocrine element. Each component comprised more than one-third of the neoplastic tissue; therefore, we finally diagnosed it as mixed ductal-neuroendocrine carcinoma. Pancreatic mixed ductal-neuroendocrine carcinoma is a rare tumor whose frequency in pancreatic tumors is <0.2% and reveals expanding or invasive growth in the pancreatic parenchyma. There has been only one case report of minute mixed ductal-neuroendocrine carcinoma with predominant intraductal growth similar to this case. In this case, we assume that ductal adenocarcinoma would be initially derived from an intraepithelial lesion in the branch duct adjacent to MPD and that it would partially differentiate into neuroendocrine carcinoma during the growth in MPD. This resulted in a very rare case of unique mixed ductal-neuroendocrine carcinoma with predominant intraductal growth in MPD without a macroscopic intraparenchymal lesion. Cubilla AL, Fitzgerald PJ. Cancer of the exocrine pancreas: The pathologic aspects. CA Cancer J Clin 1985;35:2-18. Chetty R, El-Shinnawy I. Intraductal pancreatic neuroendocrine tumor. Endocr Pathol 2009;20:262-6. Terada T, Kawaguchi M, Furukawa K, et al. Minute mixed ductal-endocrine carcinoma of the pancreas with predominant intraductal growth. Pathol Int 2002;52:740-6.